Have you heard of Elephante? Those with an ear for emerging EDM music know that this DJ is the real deal. 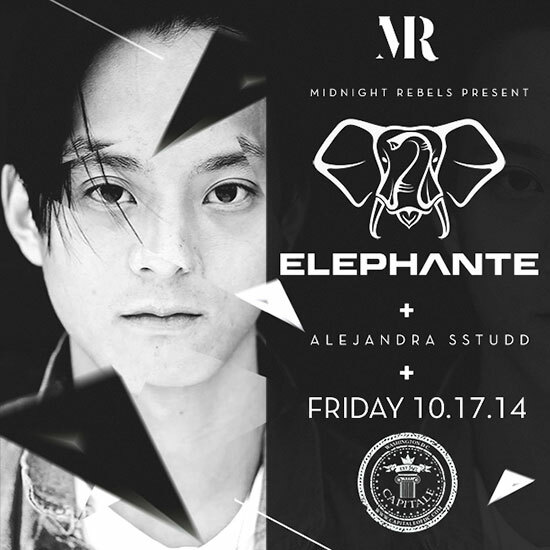 Our friends at Midnight Rebels are event planning veterans and worked hard to get a name like elephante, a venue like the Capitale, and still keep the ticket price at only $20. Don’t miss your opportunity to catch one of the hottest DJs in the game before he inevitably becomes too mainstream to see outside of a giant arena or music festival. The Hunt, not to be confused with the Far Hills Horse Race called “The Hunt” in New Jersey, will feature two of the best cover bands that will be sure to provide some amazing jams that you all know and love. 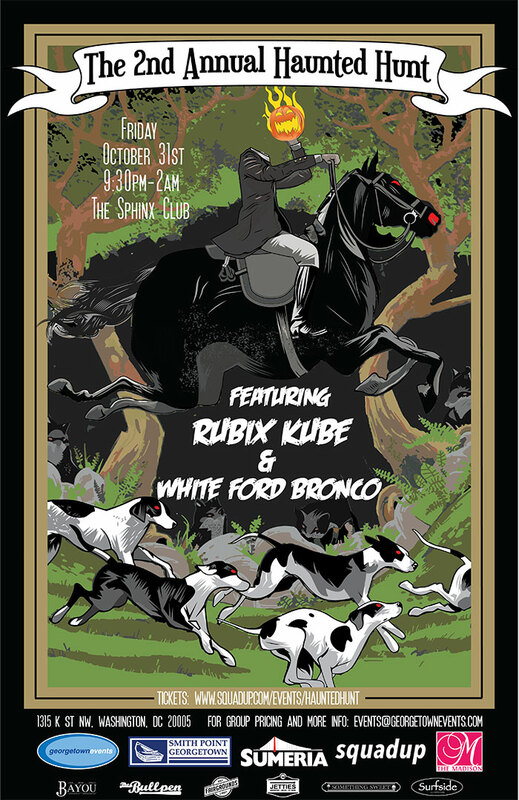 DC legend White Ford Bronco will kick the night off with a set of the best songs from the 90′s followed by Rubix Cube of NYC laying down some of the sickest tracks from the 80′s. And they recently locked up Dale and the Z Dubs to open up the night — a killer DC band that will get things started right. The event will take place in the main ballroom at The Sphinx Club, the premier event venue in DC, which will have a large dance floor and multiple bars on the main floor as well as the mezzanine. Your ticket includes open bar from 9:30pm until 2am for liquor, beer and wine. Party goers will also have access to our Fireball shots bar on the upper level. To make the deal even sweeter they have partnered with Uber to offer a free ride to the event. Sign up for Uber and use code “hauntedhunt” and your ride is on them! So prepare your best costume for a chance to win a prize for Best Costume and Best Group Costume. Winners receive a $200 bar tab at Smith Point and $50 at Jetties and Surfside. Looking for a new Halloween event? Friday, October 31 (duh!) is the inaugural “Halloween with a View” at the Key Bridge Marriott, where they have rented the entire top floor. The Potomac Ballroom, complete with its 360′ breathtaking views of the city, is guaranteed to make it a legendary Halloween. The event features a full premium open bar, light appetizers and snacks, and DJ Esso laying down his signature Top 40 remixes and high energy beats – only matched by the skyline view. Make sure to buy your tickets soon! They wanted to make this a smaller, more intimate affair, so the event will be capped after roughly 200 tickets are sold. Pre-parties and after-parties will be held at Chinese Disco, “Chi Di“, which happens to be less than a mile away just across the bridge. Full costume required! Be prepare to get dressed up to get messed up! We’re always looking for new, qualified event organizers in DC. If you know anybody worthwhile, feel free to connect us and get the ball rolling!